Goldberg Persky White P.C. Attorneys at Law is there for victims of asbestos and has been a pioneer in the industry since the first asbestos lawsuits were filed. The law firm assists people as they take legal action for mesothelioma, lung cancer, asbestosis and related cancers. In addition to their long-standing asbestos practice history, the firm’s attorneys represent clients with injuries stemming from other toxic exposures to solvents, benzene and welding rods. Although they cannot undo physical damage, the attorneys use their unique expertise and experience to generate comprehensive settlements for asbestos and other toxic exposure victims. The law firm also represents clients with a broad array of medical malpractice injuries. The attorneys are equally capable in helping people with injuries from specific devices such as metal-on-metal hip replacements, transvaginal mesh and hernia mesh as they are assisting victims of general misdiagnosis, negligence and wrong-site surgery. Additionally, the firm takes cases involving harmful drugs. While the attorneys are skilled negotiators, if necessary, they are fully prepared to square off with medical insurance companies in court. Beyond representing victims of asbestos exposure and medical malpractice, Goldberg Persky White P.C. Attorneys at Law offers assistance to people with a wide range of personal injuries. They routinely handle cases involving car and truck accidents, brain and concussions injuries, wrongful death, dangerous products, gel fuel burns, nursing home abuse and negligence, accidents on the job and property damage. Prospective clients across Western Pennsylvania and statewide are invited to receive a free initial consultation and case evaluation. At Goldberg Persky White P.C. Attorneys at Law the experienced team is there to help personal injury victims and families who have lost loved ones in accidents in Saginaw, Michigan. The law firm routinely represents clients hurt in collisions on the road and accidents at work, whether they sustained a concussion or devastating brain injury. Additionally, the attorneys advocate for people hurt by gel fuel burns, hazardous products, property damage, nursing home abuse and drunk driving. In the event an insurance company offers an insufficient settlement, the firm pursues better in court. When the attorneys are not providing knowledgeable counsel to personal injury victims, they are delivering aggressive and focused advice to clients exposed to asbestos, lead, benzene, welding rods and toxic solvents. These incidents have far-reaching implications on workers and families, both physically and financially. Many face the reality or prospect of lung cancer, mesothelioma, asbestosis, Parkinson’s and Parkinsonism, along with a lifetime of medical bills and lost income. The law firm’s lawyers are highly skilled in representing victims of occupational dangers. In one recent case, they were able to negotiate $3.8 million for the family of a Local 2 Asbestos worker who died of mesothelioma. Goldberg Persky White P.C. Attorneys at Law also represents clients hurt by medical malpractice in most every form. They offer honed counsel for people injured by specific products such as metal-on-metal replacement hips and transvaginal mesh as well as harmful drugs such as Ephedra. Additionally, the law firm handles cases involving misdiagnoses, wrong-site surgeries and gross negligence. The attorneys offer a free initial consultation to prospective clients across western Pennsylvania. When people in Weirton, West Virginia, need honed and aggressive legal assistance following exposure to asbestos, they turn to Goldberg Persky White P.C. Attorneys at Law. The law firm has successfully helped clients claim millions in settlements that cover wages lost along with a lifetime of medical costs for conditions such as mesothelioma, lung cancer, asbestosis and colon cancer. Many of GPW’s clients worked at Weirton Steel and Wheeling Pitt Steel. In a recent case, the attorneys were able to negotiate $1.1 million for an oil field worker living with mesothelioma. In addition to asbestos, the firm represents clients hurt by benzene, welding rods and toxic solvents. In addition to asbestos counsel, the law firm offers broad help for a wide range of personal injuries. The attorneys have helped families after a collision with a car or truck leaves victims with catastrophic brain injuries. They are also experienced in advocating for people with concussions stemming from contact sports as well as those hurt by dangerous products, nursing home abuse and accidents at work. Although no settlement can turn back the clock or undo the wrongful death of a loved one, the firm’s attorneys make it their mission to pursue maximum compensation. Goldberg Persky White P.C. Attorneys at Law is also equipped to help victims and families affected by medical malpractice, no matter if it is through misdiagnosis, negligence or dangerous drugs and devices. Regardless of what brings them in, the law firm invites prospective clients in Weirton and all of West Virginia to contact GPW’s attorneys to discuss their cases with them in a free initial consultation. When asbestos exposure near Southfield, Michigan, leads to a mesothelioma diagnosis, Goldberg Persky White P.C. Attorneys at Law is there to help. The law firm offers fierce representation to asbestos victims and their families. From Ford River Rouge Plant to Great Lakes Steel, to McLouth Steel and the Defoe Shipbuilding Company, GPW’s attorneys have helped workers injured by asbestos throughout the Detroit area and beyond. A diagnosis of lung cancer, colon cancer, mesothelioma or other asbestos disease is never an easy one to cope with, and GPW’s attorneys fight tirelessly to achieve the best possible outcome for their clients. For more than three decades, Goldberg, Persky White P.C. Attorneys at Law has helped Michigan workers and their families navigate complex and highly specialized asbestos cases. With thousands of supporting documents, hours of expert testimony and an in depth knowledge of bankruptcy trusts, Goldberg Persky White P.C. Attorneys at Law is uniquely positioned to provide aggressive, effective and efficient representation to mesothelioma and asbestos cancer clients. In a commitment to providing exceptional service, regardless of what the case entails, the attorneys offer a free initial consultation to all prospective clients. For over 30 years, the attorneys at Goldberg Persky White P.C. Attorneys at Law have represented thousands local workers near Johnstown, Pennsylvania, who have been injured by asbestos. Occupational asbestos diseases such as mesothelioma, asbestosis and lung cancer often affect workers such as those at Bethlehem Steel, Homer City, Seward, Conemaugh and U.S. Steel. These diagnoses can devastate victims and leave their families with the financial burden of mounting medical costs. The knowledgeable attorneys at Goldberg Persky White P.C. Attorneys at Law also represent victims of toxic exposure to lead, benzene, welding rods and toxic solvents. Oil and gas drilling accidents can result in contaminated water, burns or other injuries to individuals or property. A ruined water supply, whether the result of neglect or malicious intent, can cause huge portions of farmland to lose their value, resulting in serious financial loss to families and lasting damage to the environment. Goldberg Persky White P.C. Attorneys at Law understands each situation is unique to the victim and does everything in its power to reach a fair settlement. Whether from ignorance, carelessness or just plain greed, medical malpractice caused by professionals in the medical community can inflict devastating consequences on victims and their loved ones. 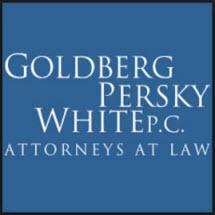 The law firm of Goldberg Persky White P.C. Attorneys at Law is highly experienced in advocating for clients injured by transvaginal mesh, hernia mesh, metal-on-metal hip replacements, and other dangerous medical devices. Wrong-site surgery, negligent medical care, misdiagnosis and incorrect medications can be complex. The skilled attorneys at Goldberg Persky White, P.C. Attorneys at Law are able to piece together the facts to protect the rights of the client and uphold the standard of care that should be received. Goldberg, Persky White P.C. Attorneys at Law handles many personal injury cases. Common personal injury cases such as traffic accidents, slip-and-fall cases and defective products can cause irreversible, catastrophic damage, and the experienced attorneys at Goldberg Persky White P.C. Attorneys at Law are ready to defend your rights. Goldberg Persky White P.C. Attorneys at Law also supports victims of brain and concussion injuries, dangerous products, nursing home negligence and wrongful death. No matter what kind of personal injury is suffered by you or a family member, the law firm invites prospective clients to contact and meet for a free initial consultation at their office. The residents of Greensburg, Pennsylvania, can count on the attorneys at Goldberg Persky White P.C. Attorneys at Law to accurately and effectively represent those who have been harmed by asbestos, lead, benzene, and other occupational and environmental chemical exposures. Goldberg Persky White P.C. Attorneys at Law represents those suffering from lung cancer, asbestosis, mesothelioma and other fatal asbestos-related illnesses. Goldberg Persky White Attorneys at Law understands the complexity in trying to determine the connection between asbestos and asbestos-related diseases .Their extensive database, accumulated over 30-plus years, has thousands of corporate documents on over 35 asbestos job sites located in Greensburg. The law firm also represents those who have experienced harmful chemical exposure and property damage relating to damaged or improperly drilled wells. Goldberg Persky White P.C. Attorneys at Law knows that when profits are at stake, innocent victims are at risk as safety precautions are often glanced over. Understanding and extensive knowledge of the serious health risks and complications that arise from toxic exposures is what makes the law firm unique, effective and successful at defending your rights. As personal injury lawyers, the experienced attorneys at Goldberg Persky White P.C. Attorneys at Law have dedicated their practice to helping hurt individuals protect their rights for over 30 years. Using their own investigation and forecasting techniques, the law firm is able to determine the true extent of injuries sustained from car and truck accidents, concussions, slip and falls, dangerous products, and gel fuel burns, resulting in the compensation you deserve. Goldberg Persky White P.C. Attorneys at Law believes that if you have sustained injuries through medical malpractice, you should not have to suffer alone. Goldberg Persky White P.C. Attorneys at Law represents individuals who have sustained injuries from negligence from a medical professional and medical devices, including: transvaginal mesh, hernia mesh, and metal-on-metal hip replacements. The firm’s attorneys also advocate for people hurt by harmful drugs such as Ephedra and other products such as talcum. The attorneys’ vast knowledge and experience allows them to negotiate fair settlements so victims will receive the compensation they deserve. They offer a free initial consultation to prospective clients across Western Pennsylvania.